A few days ago, I was browsing through the kids section of Neflix and noticed Sarah Hyland on a movie poster. While I am not a huge fan of “Modern Family”, I had found her interesting before which led me to click on play. This made for TV movie stars Sarah Hyland of the “Modern Family” fame in the role of a Dylan Schoenfield who is one of the top members of her high school’s social hierarchy. As it is easy to glimpse from this first sentence, “Geek Charming” follows in the footsteps of the “I’m in high school and popularity is important” genre of teen movies such as “Can’t buy me love” which came out in 1987. The movies in this genre follow a specific formula. There is a popular student who is usually a girl, but not always, and a less popular student who is usually a nerd, geek, artist and of the opposite gender of the popular student. Through some arbitrary incident, the two end up hanging together, a makeover montage, and at the end the popular student understands that popularity is not important. While there are literally hundreds of movie of different calibers in this genre, there are surprisingly little deviation from the core formula. Changes usually come in the form of background setup elements such as the reason why the two lead endup hanging out. In the case of “Geek Charming”, it is because Sarah Hyland’s characters is trying to win prom queen and the male lead is a film buff who wants to make a documentary about popularity for a film festival. However, these differences are not usually significant enough to be seen as introducing something fresh. This is also true in the case of “Geek Charming”. The setup has actually been uses in many movies or TV shows. So, what differentiates movies in this genre? More than other movie genre, the manner in which characters are portrayed and the screen presence of the actors portraying the characters are key. Us, the audience, has to fall in love with the characters at least before the 30 minute point of the movie which is not an easy thing especially when the scripts in this genre are not much to talk about being very generic. Even when the popular kid is acting in the manner that we, as the audience, do not approve, we have to be in love with the character to the degree that we wish that the character would change. So, how does “Geek Charming” perform in this area? The movie starts off rocky. If you have seen “Modern Family”, you know what Sarah Hyland’s character is like. There is a rather automatic distance that her portrayal of the character brings which is odd for a character that should be popular. She is not exceptionally charming, pretty, or well endowed. She small, flippant, and oddly feels like a chipmunk. You would not really believe that she is actually popular. 10 minutes into the movie, I had already given up on the movie as it wasn’t doing anything new, the characters were not connecting with me. So I was surprised by the fact that, at the end, I was actually impressed by the manner in which all the characters were treated genuinely and not as caricatures to get a quick laugh or to trick the audience in to rooting for the leads. All the characters displayed an underling emotional bond towards other characters. For example, in many movies, the entourage of the queen bee tends to distance themselves when the queen bee slums as a result of hanging with the unpopular kid. While this does happen in the movie, you still see that there is an emotional bond between them and the actions of the entourage is more of a reaction to queen bee being preoccupied by this new relationship rather than a consequences of shifting popularity. Even though the past actions of the queen bee were not always up to the standard of true friend, they were friends and the bond shows. Sarah Hyland also was a surprise. When her character shows vulnerability, it combines with her previous behavior to become sweetness. As this sweetness is so surprising and out of the blue, it lowers your defenses and opens your heart to the character. In this genre, there is not more a character could do. The main problem with this movie, other than being a made for TV movie, is related with the male lead. Matt Prokop, who played the lead film geek, does not have a defining moment compared to Sarah Hyland in this movie. He was a hipster at the start of the movie and this does not change at the end. In addition, his chemistry with Sarah Hyland is not always there making It difficult for the audience to see him as one end of a romantic relationship. Rather, he feels like a character that would always be stuck in the friend zone. Not even a makeover montage with a new wardrobe could fix that. It does not help that sometimes he looks either like a vampire or someone with a serious coke problem. However, that may be a makeup problem. 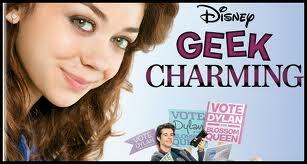 At the end, “Geek Charming” is a small scope made for TV movie that ends up surprising its audience. For a TV movie, that is a huge achievement. I cannot get out of head the face the mother of the character played by Matt Prokop. She had this face saying that his son was so cute having romantic problems.... That gave me a smile.